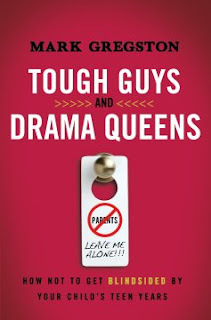 Tough Guys and Drama Queens: How Not to Get Blindsided by Your Child’s Teen Years by Mark Gregston had me with only the title. As a mom of an almost-eighteen-year-old—where everything has certainly not been smiles and cakewalks, it is time to summon the courage to brave those teen years again, with not one, but two more drama queens in training. Knowing that we did some things right during our first round of teen raising/grey hair sprouting, we also know that we have room for improvement as our younger girls near tween-ages. What was our review of Tough Guys and Drama Queens: How Not to Get Blindsided by Your Child’s Teen Years by Mark Gregston? A quick summary of Tough Guys and Drama Queens by Mark Gregston. Gregston provides readers both sides of the parent/teen relationship as he explores many of the driving forces behind the social dynamics of many homes. Over worked parents seeking to protect (or over protect) and nurture (or coddle), teens constantly zapped by a society full of conflicting influences and demands, and families struggling to find balance and harmony. Gregston, who founded and operates Heartlight Ministries, a Christian residential counseling and educational program for troubled teens, encourages readers to develop, and work hard at maintaining, a strong teen/parent relationship even when it feels impossible and develop a teen parenting action plan long before the teen years. Tough Guys and Drama Queens encourages strong relationships—and a realization that teens and parents are on the same team. Gregston offers up a number of teen behavior insights that even sensational parents overlook. What happened to the daughter who used to tell me everything? Why is my honors student suddenly failing classes? Even for in-touch parents, I think there are valuable behavioral insights to be gained from Gregston’s years of teen counseling. Gregston provides insights, support and motivation for parents through Tough Guys and Drama Queens. Gregston devotes a section of the book to “Parenting Practices that Really Work”. Who does not need a few tried and true parenting practices? Honestly, the reason that many parents seek out such books is for advice and insights into something they have missed. This book does not let readers down. It does not claim to have all of the answers--but, does have real world examples, situations and responses. Final thoughts on Tough Guys and Drama Queens. Tough Guys and Drama Queens does not sugar coat realities. It does not belittle parent/teen struggles or parent concerns. It offers advice, without preaching. Sometimes parents need to think outside the parenting box. Tough Guys and Drama Queens is a terrific read to encourage a different train of thought than the one so many loving parents ride every day. You can learn more about the author at Parenting Today's Teens with Mark Gregston. Ready to buy Tough Guys and Drama Queens? Buy the paperback at Amazon.com. Disclosure of Material Connection: I received this book free from the publisher through the BookSneeze®.com book review bloggers program. I was not required to write a positive review--just an honest review. As always, the opinions I have expressed are my own. I'll have to check out your list--I'm always looking for my next good book!